Stade Francais coach Jacques Delmas was predictably downbeat after watching his side's 29-0 defeat to bitter rivals Toulouse in front of 79,000 at the Stade de France. Stade now are six points outside the play-off places, with defeat capping a troubling week in which their tug-of-war with England over the services of flanker James Haskell dominated the headlines. "After a performance like that, it's difficult to imagine us participating in the play-offs," Delmas told Midi Olympique. "To do that you need the means and judging on today, we don't have it. At the moment our eyes are only being used for crying. That might be a dramatic acknowledgement but that's the way it is. "This is still a great club. A great team - I have my doubts...but let's not throw the baby out with the bathwater here. The championship isn't finished yet. 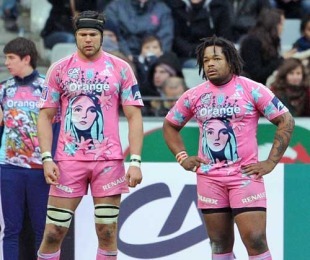 At the same time, in light of the performance today, you'd have to say that Stade Francais are a mid-table team. Nobody is afraid of us." With a 35-10 victory in the bag against Brive, this season's surprise package Castres reclaimed their place at the head of the Top 14 from Clermont Auvergne. The bonus point win over les Brivistes put to bed the nagging fear that the Six Nations would take the steam out of Castres' Top 14 challenge, according to coach Laurent Travers. "The Six Nations could have upset our rhythm so I'm really happy to have got the five points and scored four tries. 1995 was the last time we qualified for the playoffs so that explains why there's so much enthusiasm in general," said Travers, in an interview with La Depeche du Midi. "For now though we will be wary. We must still make a lot of progress." Meanwhile, French champions Perpignan went down 21-17 to Clermont at Stade Marcel Michelin in a rematch of last season's final but USAP coach Jacques Brunel was generally happy with his side's performance. "It was a game of twists and turns," Brunel told l'Independant. "Clermont were more inventive than us but we were strong in defence and impressive at scrum time. We gave a good example of a team defending their title."